The electrifying capital of Spain, Madrid is one of the country's most vibrant and exciting cities. Madrilenos make it a daily practice to take time to enjoy life, and now you can do the same when visiting the Hard Rock Cafe Madrid. Located at Plaza de Colon along the historical Paseo de la Castellana, the Cafe awaits as your fiesta destination for enjoying this rollicking city. 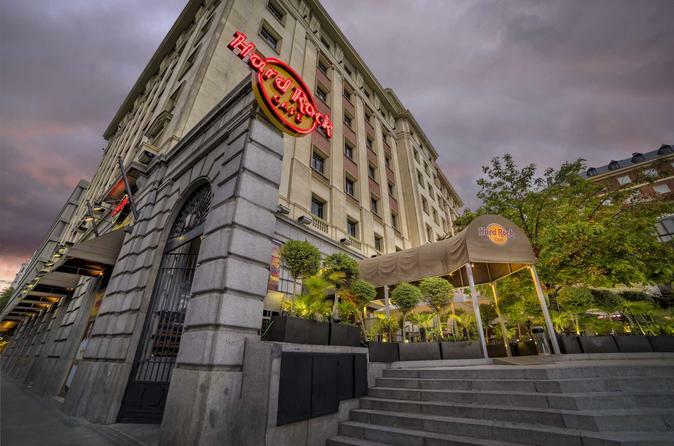 The Cafe's outstanding memorabilia collection and the majesty of this fabled city with nearby views of the National Library, the Cultural Centre of Madrid, and the beautiful oceanic fountains of Colon, will completely invigorate you, so get ready for the all night extravaganza, Hard Rock style! Choose from two different menus – the 2-course Gold or 3-course Diamond – and then sit back, relax and enjoy your meal. The cafe also has an on-site store, which you can explore after your meal if you wish.